Choosing the ideal swimming pool filter system can help you to maintain your pool facility in the right shape for a long time. If you have been seeking helpful information about the best pool filters, then you are in the right place. We are always dedicated to assisting our customers to install the most efficient filter system for their pool facility. Having an appropriate pool filter will save you lots of money and time since you will minimize expenses on repairs. Some pool filters are ideal for above-ground pools while others are suitable for in-ground pools. You need to install a pool filter system that will help you maintain clear and safe water in your facility. Which are the most efficient types of swimming pool filter systems? They are three main types of pool filter systems including the DE (Diatomaceous Earth), Cartridge, and Sand filter systems. Each has its own pros and cons. Therefore, you should compare the benefits and drawbacks of installing each type of the filter systems so as to make an informed choice. You just need to choose the pool filter system that best suits your personal needs and preferences. DE filter systems are considered to be among the most efficient pool filters. However, they are quite expensive to buy and operate. They are efficient in filtering very minute particles (4 microns). A majority of pool owners claim that that these types of filters provide the clearest and cleanest water. However, using a separation tank for trapping the DE while backwashing, will yield more positive results. The separation tanks can be quite expensive, but it is worth to invest in them. It is crucial to install your DE in an area that is open and well ventilated. That is the surest way to minimize potential health risks. 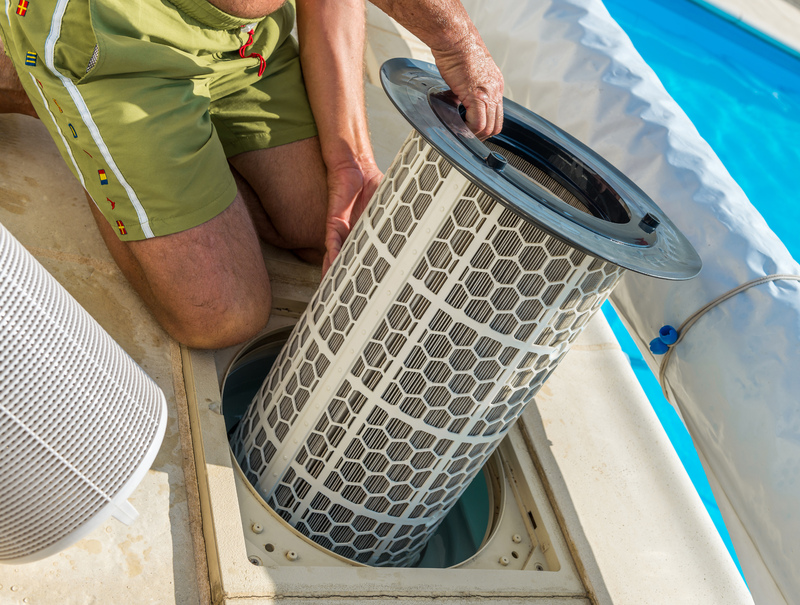 Cartridge filters are also used by many pool owners because they can filter particles as small as 15 microns. The main drawback of using these filters is that they allow huge particles back into the swimming pool since they are easily affected by blow-by. Blow-by is common every time the pump pushes a high volume of water via it. Although experts suggest that cartridge filters are only ideal for Spas, they are now typically used in many above-ground pools. If you opt for this type of filter, you must be prepared to disassemble it when cleaning the cartilage and then reassemble it. If you use lots of oils in your pool such as suntan lotions, you will shorten the lifespan of your cartridge filter system. You must be prepared to replace the cartridges after every six months. As a consequence, they are not ideal for cleaning pools with a lot of algae growth and dirt. Sand filters are still popular among many pool owners. They are quite affordable and, therefore, preferred by many pool owners. These filters are not very efficient and require you to utilize flocculants and filter aids. They only have the capacity to catch particles of 25 or more microns. The current sand filters can distribute unfiltered water over a sand bed, especially the ones containing white silica. The pool pump is usually used to push the water to the bottom. The water then flows through laterals (piping) with tiny holes that prevent sand from passing. The filtered water can then be channeled back to the swimming pool. If the pool pump water is very intense, channeling happens where channels form between the bottom and the top of the filter. Instead of the water filtering down evenly and correctly via the entire sand, it follows the easy path. Channeling can also be caused by flocculants and other filter aids. What type of pool filter system is ideal for you? The two commonly used types of filters include the cartridge and sand filters. Both filters have been shown to be efficient in delivering clear water provided that the correct sanitizer and water levels are maintained. A cartridge filter system needs minimal maintenance and reduces water loss. It can pack the entire lot of the filtering section in a compact tank enabling you to enjoy prolonged filter cycles in between cleaning schedules. A cartridge system is efficient in reducing water loss because it doesn’t have a backwash valve. However, you have to dismantle the filter to clean the cartridge. You can either soak in the filter or hose it down in a cartridge cleaning solution. On the other hand, a sand pool filter system requires maintenance after every five years. You also need to be aware that you will be losing water each time the filter is backwashed. However, a sand filter makes routine maintenance easy because it cleans itself by just turning a valve handle. A majority of pool owners also consider a sand filter more convenient to use.